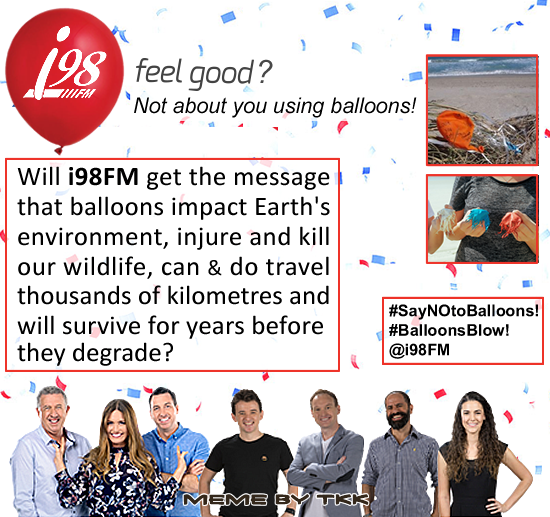 Recently, on a FaceBook community group’s page – Plastic Free Wollongong I noticed a post from a member expressing their dismay that our local radio station, i98FM, was handing out Balloons. I first posted it to the Plastic Free Wollongong group FaceBook page and then on the i98FM FaceBook page. On Thursday, 13 September 2018 at 8:57am i98FM responded. It is rare to get a response and rarer still to get such a positive outcome. So the moral of the story is that we must always stand up for the environment against the actions of businesses, groups and especially the government. Because sometimes they listen, sometimes they respond, sometimes they act. 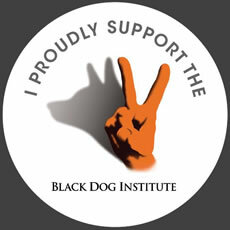 NVDA (Non Violent Direct Action) can, will and does work. Thank you TeeKay for sharing this awesome result. Thank you i98FM for listening and acting appropriately. Well Done!! Bugger! Not the first comment..
An awesome result for our most vulnerable co-habitants. Thank you i98FM for acting and stopping any chance that your use of balloons impacting all critters great and small. And thank you TeeKay for bringing it to i98FM’s attention and also acknowledging i98FM’s awesome decision by posting about it on your Blog. Thanks for being a wonderful advocate for the environment TeeKay. 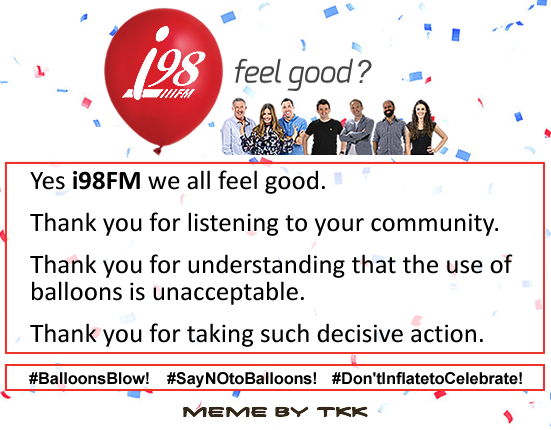 Thanks also to i98fm for listening to their community but also acting in a positive, inspirational manner with their decision to stop using balloons immediately. Maybe you should do one for ING bank what with Isla Fisher handing out balloons. What a wonderful result TeeKay. Thank you for your part in achieving this terrific result that will prevent many deaths in both our avian and marine cousins. Thank you also to i98FM for not only listening to their community but for the positive action that will result in less suffering and less litter. I seen the link to your blog post on the i98FM website. (Awesome result btw.) I was interested in what else you had to offer on your blog. An excellent result TeeKay. NVDA is always the best approach. Credit must be given where credit is due and i98FM responding so quickly to the voice of their community certainly requires acknowledgement. What an amazing effort by the community and, more specifically, you TeeKay. Also thank you, on behalf of all marine life, must go to i98FM from here on the other side of this small planet. What a wonderful outcome for all involved.